Welcome to our 3rd day of "Halloween Hustle"! We will have 5 days worth of last minute ideas to trick your treats! You will ALSO see 3-D projects, home decor & even cards! I hope you are ALL ready for some HALLOWEEN HUSTLE "FUN"! There will be giveaways all week! Not only will a gift card fit in here, but you can use a glue dot on the inside & add a "fun size" bag of M&M's! For this one, I fit my FAVORITE chocolate candy & placed it on the inside using a glue dot! Now onto my FABULOUS design team! Don't forget to click on each of their names to visit each blog! To qualify for this giveaway for today, all you have to do is leave a comment here on this post! For more chances to win, also leave a comment on my design team's blogs as well! VERY IMPORTANT: don't forget to leave a way for us to contact you just in case you are the lucky winner! The deadline for comments are tonight, Oct 23st @ 10pm PST! GOOD LUCK! I love the spookiness yet elegance of this Halloween card! Great use of this embossing folder and Emma's stamps! CONGRATS Miss Julie! Please email me here: info@my-creative-time.com your address so I can get your prize in the mail! Oh Emma your treat holders turned out so cute. I love what you used to make the pumpkin how clever. Your new teeny tag stamp set is awesome can't wait to get it. Thanks Miss Emma for always sharing clever new ways to use your goodies I'm always amazed at the clever and unique ideas you come up with for your crafting. Love that teeny tag set and these projects are very inspiring. Congrats to Julie. Thanks for another giveaway. Very cute treatholders. I always come to your website first for inspiration. You and your design team are so talented. I love seeing everyday what you all have created. Thanks for the inspiration. Looking forward to the new stamp set! You all have been so creative, love all the Halloween ideas! Another super awesome day of projects!! SO LOVING all the Halloween inspiration!!! Thanks for sharing and have a GREAT hump day Emma!!! Loving the way you use the dies. You bring out the crafter in me.. Always love seeing what you create!! Super DUPER cute & YUMMY treat holder!! I have that die & I LOVE it!!! Love how you used the egg dies for pumpkins! AWESOME!!! Lovin' all the fun Halloween projects!! Love your sweet idea to use the gift card holder as a treat holder-creative idea!!! Have a super day and thanks for a chance at such a fabulous giveaway! Such cute treat holders! I love seeing all the inspiring Halloween projects! Wow!!! So much fabulous inspiration!! I just can't believe how creative you and your team are. Awesome!!! Oh I am in love! I just discovered your site and I want it all! You have a super creative mind! So many great ideas. Love all of the inspiration. Can't wait to order the teeny tags holidays. Love them. Emma you are just amazing! love your ideas and wonderful tutorials. this candy holder is so cute. great alternative way to use this die. I LOVE your wonderful treat holders. Love the cute pumpkin and I sooo need that Teeny tag holiday set. TFS. Adding my applause and voice to the wild cheers of how AMAZING your projects are today (as they are every day, by the way!!) Your creativity + your products = perfect recipe for fabulous inspiration!! Thanks for sharing!! Fabulous inspiration! Love that black kitty! Love the building pumpkins from other shapes - it looks so awesome! Thanks for all of the inspiration! Every single project is fabulous. I hope I have time to ake them all. Great job and thanks to all. I love that new stamp set coming out!!! I have a feeling your going to sell out in the first hour! !, LOl. Or may be even 15 minutes!!! I must say that I have been so inspired by this week's Halloween Hustle. I don't get into decorating or making treats for Halloween but the Hustle has me ready to get started Hallow-crafting. I have several MCT sets that I have not used yet and I can't wait to break them in. the MCT design team has do yet another fabulous job. Super cute treat holders, love the sequins. And you have no idea how EXCITED I am about the new Teeny Tag sentiments, Emma. Thank you, thank you, thank you for expanding this collection. Very cute treat holders Miss Emma! I love the pumpkin made from the egg die. 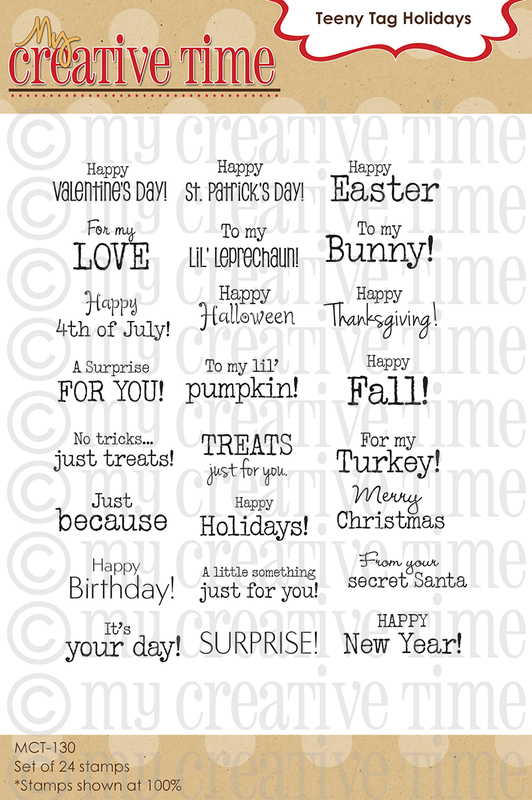 I can't wait to order the new teeny tag sentiments, I just love them so much!! 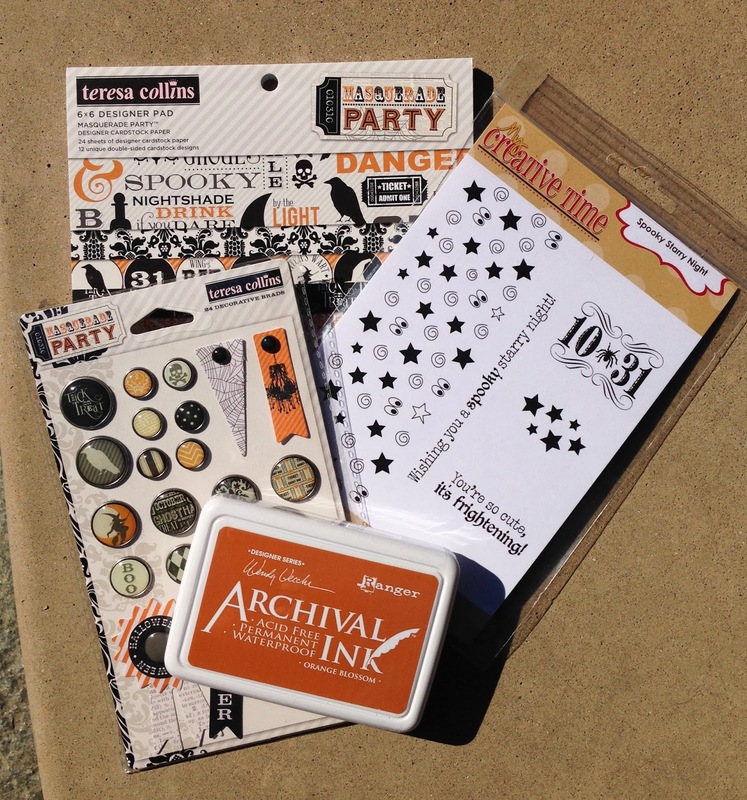 Loved all of today's projects - but oh EMMA, so loving the new teeny tag stamp set! Can't wait to order! I just love how you demonstrate the versatility of your dies, who would have thought eggs for a pumpkin, you that's who...lol Fabulous little treats. Hi Emma, I love your Halloween Treats ideas, thanks for sharing!!! Sweet treats! The perfect way to give yummy chocolates. Great use of the gift card die for quick holders for Ghiradellis. Love this idea! And I love how you made the pumpkin, that's awesome. OMG lovin how you made those pumpkins, hmm.. might have to rethink my order for Friday!!! Gr8t job Emma, as always! You are so creative and inspiring. Thank you for another great idea. You and your design team just outdo yourselves!!! :) I am loving all of these amazing Halloween creations!!!!!!! Great treat holders/gift card holders, Emma! You and your DT are doing a fantastic job. I am loving these halloween projects. Thanks for the inspiration. Congratulations Miss Julie...enjoy! Another day of wonderful ideas...my head is spinning...not a clinker in the bunch ;) Awesome job everyone. I can't believe you have any ideas left but can't wait to see tomorrow. My order button finger is itching and ready! What an awesome way to use the gift card holder, Emma! I have that die, so I am totally excited to make some of these! What a fun project!!! Would love to win the collection. I will have to try this - so cute! What a cute and darling project!! Emma ~ Well I LOVE all your projects and products but these egg dies and the banner are so darn PERFECT for pumpkins! 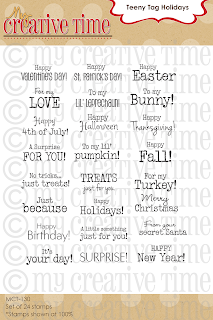 You used my FAVORITE background stamp ~ the Script.. I just <3 that stamp! You are cracking me up with those Sully gloves ~ I need them right about now ~ its freezing here with snow flurries today ~ yes in October! Brrr! Again this team is too darn creative! Love your gift card/treat holder. So cute.